Donovan Concrete has been building the highest quality foundations available for over 40 years. We are known for providing a perfectly square, flat, and smooth foundation. No foundation is too complicated for Donovan Concrete. We have highly skilled long term employees who are trained in multiple forming systems. All foundations are built precisely per plan with extra attention to rebar placement and clearance. All concrete is mechanically vibrated and consolidated during pouring to produce a superior product that is significatnly stronger to unconsolidated concrete. Crawl space and full cellar additions are handled with ease at Donovan Concrete. We are able to connect to any existing structure wether it be a block foundation, poured concrete, or stone. We install embedded waterproofing between your existing structure and the new foundation to ensure a water tight connection. Our in house excavation makes scheduling a breeze as only one contractor is needed to excavate, pour the walls, dust cover and backfill. Donovan Concrete has partnered with PierTech to offer contractors from Plymouth to Ptown access to the highest quality helical pier products, design services, and installation on the market. A digital torque monitoring system displayed in the cab to a certified operator allows Donovan Concrete to place your helical piles to your exact specifications. Average torque, final torque, and depth are recorded and able to be printed out or emailed to your engineer for verification. Contact Donovan Concrete today to start your helical pier project. Donovan Conrete specializes in excavating garages, retaining walls and additions. By combining the excavation with the concrete work we are able to save the builder/homeowner significant money and frustration as only one contractor is required to excavate, pour the foundation, and backfill. 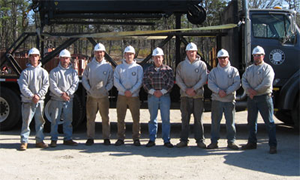 Established in 1979, Donovan Concrete is a family owned and operated business located in Harwich on Cape Cod. With a vast inventory of forming equipment, highly skilled long term employees, in house re-bar fabricator; the most challenging of residential or commercial foundations are handled with ease. Known for efficient and organized project management with the goal of concise communication with architects, builders, project managers, and homeowners, Donovan Concrete would be proud to be a part of your next project. Copyright © Donovan Concrete Form Co.